You can earn commissions by referring new users to Wild Apricot. When they upgrade to a paid account, you will get 10% of their monthly charge for 2 years. Once you have $100 or more accumulated, contact billing@wildapricot.com and we will send you the payment. 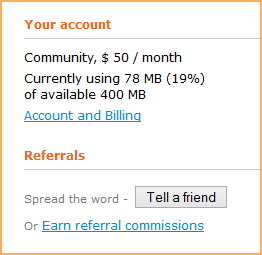 You can send referrals from your Dashboard or from the Referrals screen. You can view a summary of your referrals from the Dashboard, and details of your referrals from the Referrals screen. To send a referral without earning a commission, click the Tell a friend button within the Referrals section of your Dashboard. A generic referral message will appear that you can modify before sending. If you want to earn referral commissions, click the Earn referral commissions link and send the referral from the Referrals screen. 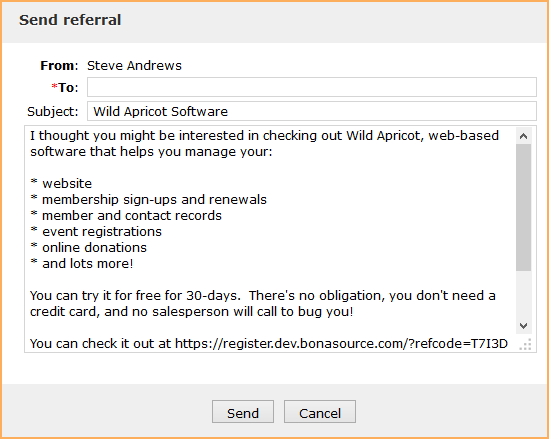 Sending a referral involves sending a special link that your friend or colleague can use to sign up for a Wild Apricot account so that you are credited for the referral. To send the link, you can click the Email invitation button and send the generic referral message that appears, or you can copy and paste the link that appears into your own email message. You can modify the generic message or just enter an email address and send it as is. You can also click the Share on Facebook and Share on Twitter to post the referral link on your existing Facebook profile or Twitter account. 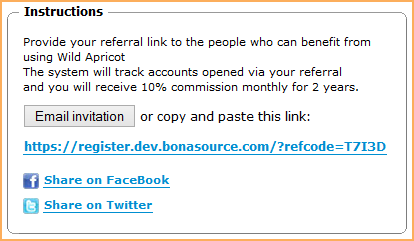 Once a referral uses the link to open a Wild Apricot site and upgrade to a paid plan, you will start earning a commission. 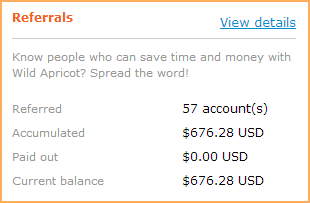 Once one of your referrals signs up for a Wild Apricot account, the Referrals section of your Dashboard will display a summary of your referrals, including the number of referrals, how much you have accumulated in commissions, how much had been paid out to you, and how much remains in your balance. To view more information about your referrals, click the View details link within the Referrals section of your dashboard. You will be taken to the Referrals screen. The Referrals screen displays a summary of your referrals – the accumulated commissions, the commissions paid out to you so far, and your current balance – along with a list of each individual referral. All amounts displayed are in US funds. If a referral has signed up for a trial account, the referral will be listed but you won't begin accumulating commissions until they upgrade to a paid plan. For more information on an individual referral, click the link under Description. A transaction log will appear, displaying information about the account and a list of each commission earned.